In 1943, 20 000 Yugoslav partisans led by Tito find themselves encircled by 120 000 well-armed Axis troops in the mountains of Bosnia and must break-out of encirclement. A man who tried to stop Nazi soldiers in World War II. 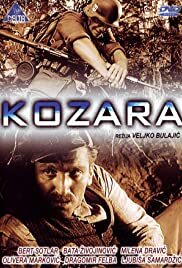 I have first seen this film about 30 years ago, in the hey day of communism in Yugoslavia, when it was, along with "Neretva" and "Sutjeska" considered an absolute classic and "obligatory viewing" for every a "well meaning" citizen. Seeing it again, after so many years, I can see why. It is full of typical communist propaganda of that era, almost enticing hatred against "the enemy", glorifying the common man and its inner strength etc. etc. all the common places of the socialist realism. Yet, strangely, on some other level, it still works. It is a very graphic depiction of what a war really is, it shows in an unapologetic way all its traumas and sufferings and also how it brings the best and the worst in different people. I also liked low brow, peasant language, yet so deep and full of wisdom. Some scenes are still extraordinary powerful. It might have once been a banner of communist establishment, however, this movie is still definitely worth a look!